The pros and cons of soy protein isolate can be confusing when you're trying to choose a protein source for a vegetarian or vegan diet. Soy protein isolate results from chemically altering soybeans through a lengthy industrial process. The resulting isolates are used in everything from baby formula to protein shakes. Some research demonstrates a slight to moderate decrease in cancer cell growth, while some prominent health writers and researchers makes soy isolates sound like Dr. Frankenstein's monster. Weigh the pros and cons of this product and decide for yourself whether it should belong in your diet. Soy isolates derive from the soybean, a plant with an interesting history. Soybeans hail form China but were not considered fit for human consumption for many decades. Eventually fermented soy products such as tofu became part of many cusines. Still later, manufacturers discovered a process of adding various chemicals to soybean curds resulted in an isolate that was high in protein yet had the texture of meat. It's this texture that makes isolates useful for the food manufacturing industry. Many vegan and vegetarian products such as faux meat, vegetarian burgers and patties are created using isolates and fillers. Soy isolates hit the market in the 1930's, but not as food. It was first used as a paint additive and in the paper industry to make ink adhere better to paper. The Glidden paint corporation capitalized on developments introduced by chemist Percy Lavon Julian, who experimented with soybeans and produced such useful products as soy "silk" which could be spun into cloth and isolates that made a good paint pigment binder. The Ralston Purina Company noted the high amount of protein created through the isolate process, which results in a powder consisting of almost 99% pure protein. It was then introduced into the food supply in products ranging from salad dressing to pet food. The manufacturing process uses a mash of soybeans with added alkalizing agents. Fiber is removed from the beans, and then the mix is washed in acid. According to Dr. Joseph Mercola M.D., a popular natural health writer, aluminum vats or tanks are used in this process which leaches unacceptably high amounts of aluminum into the resulting isolate. The resulting mixture is then subjected to very high temperatures, which some contend renders the protein difficult for the human body to assimilate. Many body builders, vegetarians and vegans enjoy soy protein powder for its purported health benefits. It provides a high amount of protein and mixes easily into drinks such as smoothies. It's easily obtained through health food stores and places such as Whole Foods markets. The U.S. Government's National Cancer Institute reports on its website that isolates of soy protein may inhibit cancer cells and tumor growth. Studies are also underway to examine potential benefits of soy products on hot flashes and in balancing hormones for women during menopause. Detractors of soy protein isolates point to the manufacturing process as a process that strips out vital nutrients from soy and adds unhealthy chemicals. Many point to aluminum as a causal factor in such disease as Alzheimer's disease, although even this is controversial. Others such as Dr. Mercola and the Weston Price Fondation believe the resulting protein powders are so denatured and chemically altered that the human body has trouble assimilating and using them. Many children fed soy isolates during a clinical trial, for example, experienced mysterious vomiting and diarrhea. Stomach upset also occurs frequently among people sensitive to soy products. Even if you don't eat vegetarian burgers or use fake meat crumbles, it's likely you're ingesting some isolates. They're added to salad dressings, ice cream and many processed foods as a cheap stabilizer and texture enhancer. While many vegetarians and vegans turn to protein powders to guard against protein deficiency, the fact is many new studies indicate humans need less protein than previously thought. Additionally, the human body has a wonderful capacity for storing nutrients such as amino acids and waiting until complementary acids appear to combine them and make a complete protein. Eating beans, rice, grains, nuts, seeds and green leafy vegetables provides adequate protein for most vegetarians and vegans. Whether or not you purchase and use soy protein powders and isolates is up to you. Some studies link them to health benefits while others claim they cause health problems. 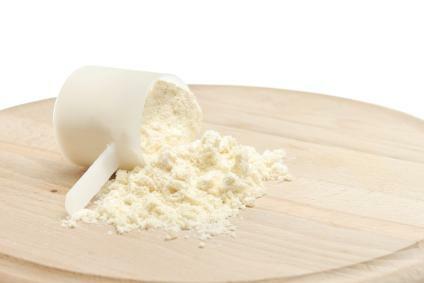 Review the evidence for yourself before you purchase your next protein powder.